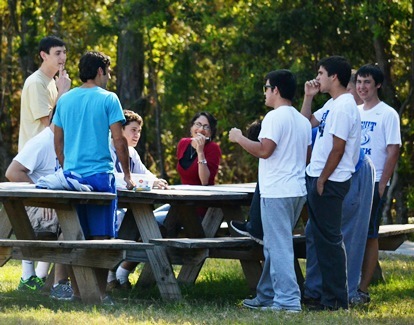 Jesuit's retreat program provides spiritual direction and guidance. It is a reflective experience designed to help a student take an honest look at his life, to know more clearly how he stands before God, and to provide tools for the further growth and development of his interior life. Every student is obligated to make one retreat during the school year. The standard retreat program for each underclassman consists of a day of reflection each year. Juniors are offered an extended two-night Kairos retreat. Seniors can select from three retreat options: a day of reflection, a one-night Father/Son Retreat, or a two-night Silent Directed Retreat. Introduces freshmen to the five elements of the “grad at grad” as well as brotherhood. This is done through a series of talks, presented by the faculty, and small groups facilitated by the Jesuit High School peer ministry team. The sophomore retreat adds to the students' understanding of what it means to be a man of God. Sophomores are asked to examine their values and an ideal, in light of God’s calling on their lives. They are also challenged on their notion of friendship and the type of friend that they are to others, as well as the effect their faith has on their relationships. Talks and small groups are led by the peer ministry team. Juniors have the choice of attending the Kairos Retreat or the Junior Day of Reflection. Kairos is the Lord’s Time. This retreat challenges the students to recognize God’s presence in their lives, to respond to that presence, and to grow closer to his classmates as brothers. Junior Day Retreats challenge the students to go deeper in their relationship with God. It allows the students to critically think about who God is and who they are in the eyes of God. Talks and small groups are led by the peer ministry team. Seniors have the option of attending a Day of Reflection, the Father/Son Retreat, or the Silent Directed Retreat. The Day of Reflection asks students to ask where God is in their lives, and what type of world are they going to try to make after they leave Jesuit. It asks them to recognize their effect on society as men of God. The Father/Son Retreat is a great opportunity for fathers and sons to grow closer to each other and God. It is also a great opportunity to grow in our own manhood. Openness and honesty gives God fertile soil to cultivate growth. The Silent Directed Retreat pairs the student up with a Spiritual Director who assists the student in hearing the voice of God in silence and recognizing God’s movements in their lives. This retreat was originally developed in 1965 and the word "Kairos" means "Lord's Time." In our busy and noisy society, Kairos gives these young men a chance to meet God in silence. It is a prayerful and reflective time where students are able to get away from their normal cares in order to learn how to hear the voice of God in their lives and discern God's movements. Some of the key themes are: knowing yourself, discovering Jesus in a personal way, prayer, responding to the call of Christ, and living out the calling that Christ has on our lives. Retreatants are led to a deeper experience with Christ, through prayer, liturgies, talks, and discussions. This retreat has been known to be one of the most memorable and powerful experiences Jesuit students have in their four years. It has been a way for students to deepen their faith, grow in the confidence that they are indeed loved, and solidify their bonds of brotherhood. Kairos is a living example of the motto of St. Ignatius of Loyola that "Love is shown more in deeds than in words." Please pray for our young men and their leaders, that they are able to hear the voice of God.